Ukrainian President Petro Poroshenko, centre,i n Kiev, Ukraine, today. UKRAINIAN PRESIDENT PETRO Poroshenko has announced the end of a martial law in the country’s border regions, which was introduced last month after Russia’s seizure of three of Kiev’s navy vessels in the Sea of Azov. 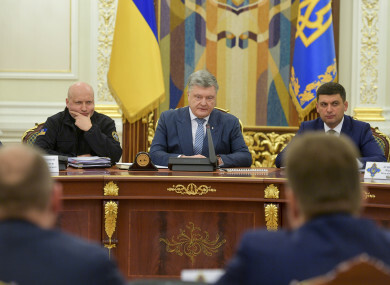 “Today, right now, at 2:00 pm (12pm Irish time) the martial law ends,” Poroshenko said during a live streamed National Security and Defence Council meeting in Kiev. The president said he had reached the decision “based on analysis of all the components of the security situation in the country”. The move to impose martial law came after Poroshenko warned of a build-up of Russian forces near Ukraine’s borders, escalating the most dangerous crisis in years between the ex-Soviet neighbours. “The support and concrete actions of our international partners — their pressure on the Kremlin combined with a martial law — have stopped the worst scenario that the Russian Federation planned,” Poroshenko said. “They didn’t let Putin cross the new red line,” he added. The martial law was imposed in 10 regions that adjoin either Russia’s borders or areas controlled by Moscow-backed separatists, as well as along the coast of the Sea of Azov and the Black Sea. Relations between Moscow and Kiev have deteriorated since a pro-Western government came to power after the 2014 revolt against a pro-Russian leader, Moscow’s annexation of the Crimea and the outbreak of war in eastern Ukraine. Today, Ukrainian president announced the new sanctions against those involved in the aggression against Ukrainian ships. “As we see the political support and participation of the State Duma in this process, a large number of State Duma deputies are included in the sanction list,” he stated, referring to the Russian parliament. Poroshenko also said that one of the reasons to end the martial law was the presidential election that is scheduled for 31 March. Email “Ukraine ends martial law in country after 30 days”. Feedback on “Ukraine ends martial law in country after 30 days”.